As much as I love the western, this Reginald Le Borg effort could easily have been adapted by the Zucker Brothers into a smash comedy hit instead of Zero Hour, the film they opted to poke fun at that gave new life to the career of a guy named Leslie Nielsen. As it stands let’s have a bit of fun with this one produced by Bel-Air beginning with the trailer that splashes these heady warnings across the movie screens. SEE! THE TRIAL BY LASH! SEE! 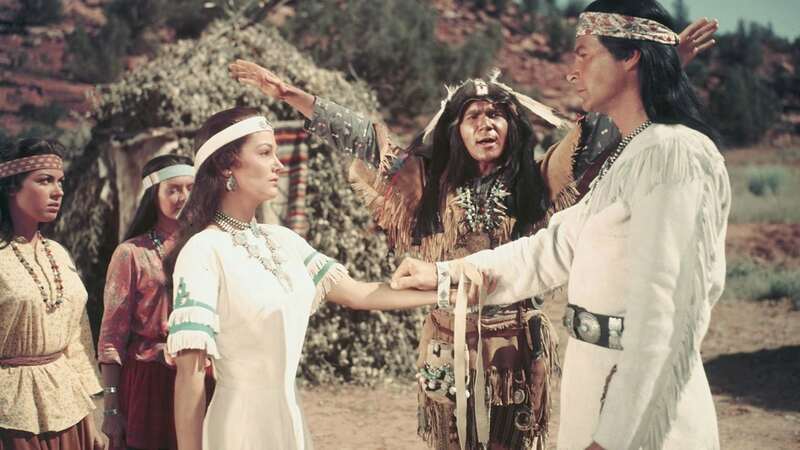 THE SAVAGE MARRIAGE RITES OF THE APACHE! SEE! THE ORDEAL OF THE THREE KNIVES! Starring as Mangas the Mighty is former man of the loin cloth, Lex Barker, taking his Tarzan act to that of an imposing Apache chief. We’ll first meet him as he and his warriors track down horses stolen from the tribe by an unsavory group of bandits from south of the border. 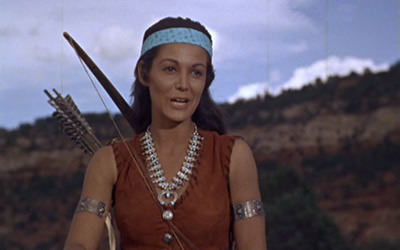 Among the bandits is Joan Taylor as a slave girl who nearly kills Barker during the skirmish. Her bravery sets her apart from the typical female captive and it won’t be long before he decides to take her as his very own Jane. Excuse me, I mean squaw. Bringing some sort of authenticity to the film is western legend Ben Johnson as a trail scout and friend to Barker and his people. Miss Taylor catches Ben’s eye as well but he can’t pry her from Barker’s grasp even after the offer of a new rifle with 100 rounds and a beautiful horse as well. 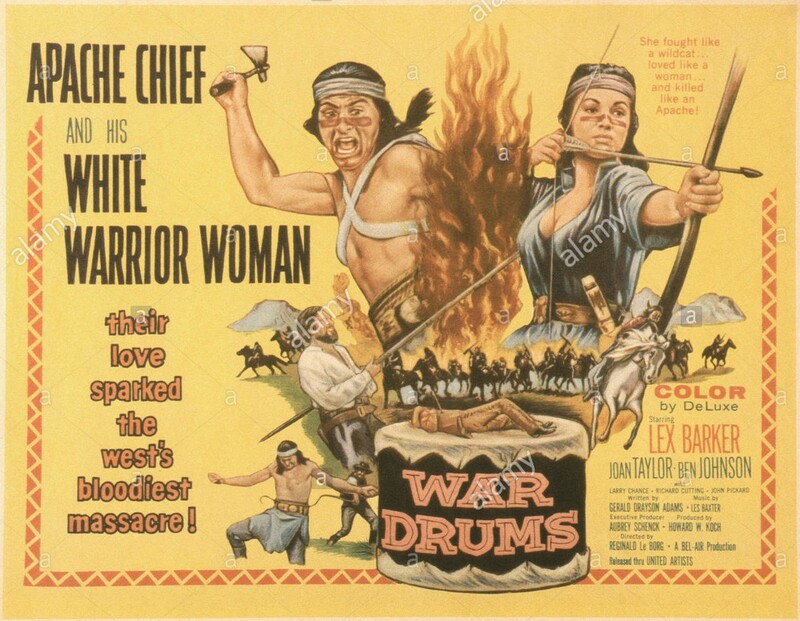 When Barker announces to the tribe he intends to take Joan for a wife he’ll have to face the ordeal of the three knives to win the tribe’s approval. No problem, this is an actor who once tangled with the most ferocious beasts of the jungle. Barker is a man of his word and has no intention of a war with the whites and his friend and champion rodeo rider Johnson. That’s all to end when a gang of shady characters panning for gold on the reservation shoot a small Indian boy and subsequently put the lash to Barker’s back as a warning. The peace treaty has come to an end as Barker picks up the knife, the lance and the arrow. With Joan by his side, he’ll ride into battle taking scalps for trophies. Ben will ride back into the fray looking to restore peace but it won’t come easy and despite his efforts blood will stain the lands when a supposed peaceful meeting goes awry. Ben himself will take an arrow and for the record the resulting scene where Joan mends him is a bit graphic compared to many oaters of the day. Ben even sneaks in a romantic line while recovering letting Joan know that, “You’re the most beautiful woman I’ve ever known.” Low budget effort that this is under producer Aubrey Schenk’s watch, it’s time to utilize some stock footage of Indian raids and newspaper headlines to advance the plot line. There’s still a rather hokey finale to follow that I don’t want to spoil but I will point out we’ll see an unbilled Stuart Whitman over the final few minutes as an expectant father in a small settlement overrun by Barker’s warriors. Stuart would go from this minor role to a seat at the Oscars in just four years with a nomination for Best Actor in the controversial film The Mark released in 1961. 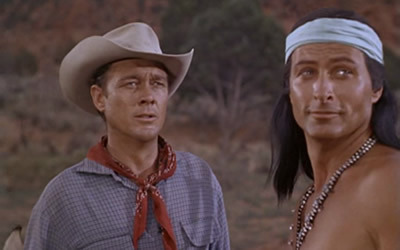 One could argue that Lex Barker is really just rehashing his Tarzan dialogue this time around as the Apache chief and I don’t think I could argue with that assessment. The whole story is strictly of the “B” film variety and if it weren’t for the participation of Ben Johnson’s cowboy persona, it might be a total loss. I mean we could have wound up with John Agar who would have been right at home here at this point in his career. Ben Johnson’s movie career in the 1950’s was pretty much a write off despite a hell of a fist fight with Alan Ladd in Shane and a couple of John Ford films, Wagon Master and Rio Grande. According to legend, he exchanged cross words with John Ford and I’ve always wondered/assumed that that’s the main reason he fell on hard times as far as landing roles over the next decade. Thankfully he stuck with the business and found a home with Peckinpah, the Duke’s stock company and earned a date with Oscar for his role in The Last Picture Show. As foolish as this effort might be I’m still a fan of the western genre in general but seriously could the folks at MGM who market the made on demand DVD’s for home video come up with something a bit more marketable for the cover of the DVD release? Slumming With Joan Collins …. A Triple Treat? Agreed said cover is not artistic nor eye catching. The movie was nothing to shout about and saw it on the big screen as a weekend matinee in a stand alone cinema ages ago. Best regards. Mike, you gave me quite the chuckle with that last paragraph of yours…what an AWFUL disc case cover! 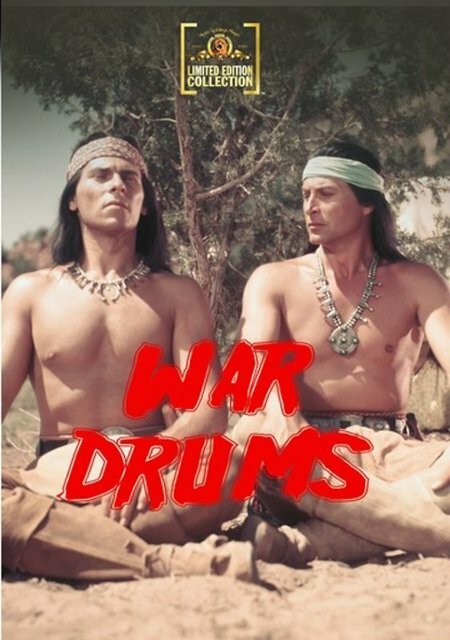 It’s like the guy on the right is saying to the guy on the left, “Wait, aren’t we supposed to have drums?” Seriously, the person responsible for that cover should be flogged! I hear yah. My wife is graphic designer and a perfectionist, she’d begin beating her own war drum to have that so called designer fired. Who do you think does all my Brando the wiener dog gag photos? If I could only get the crease marks out of all those in my collection….. but then they’d be reprints and not worth a damn. Thank you Mike. I love westerns in general and Ben Johnson in particular but I will avoid this one. The cover is one of the worst I have ever seen. Good viewing for your next western is Bite The Bullet. I too have always liked Ben on screen. never acts. He’s just honest. Bite the Bullet a good one. Have it on blu ray and yes I’m at least due for a rewatch. Great cast in that one. Thanks for chipping in. Great write up Mike,a rare Bel Air Western not directed by their go to guy Lesley Selander. Bel Air Westerns ALWAYS promised far more in their posters than what was actually in the films. If THE OUTLAW’S SON had been anything like the poster…what a film that would have been! 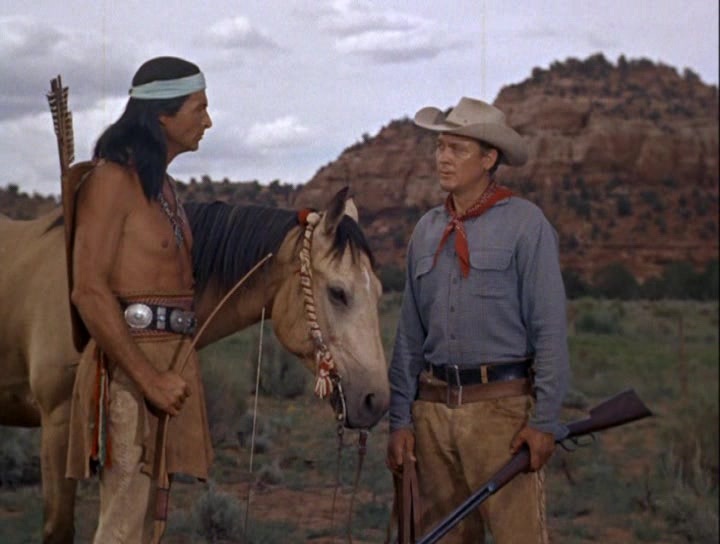 I guess I’m in a minority but I always liked Lex Barker in Westerns but not as a Native American. Some of those Indian Maidens in WAR DRUMS look as if they had strayed in from a J.D. Movie. in; a very nice widescreen transfer. I too like Barker on screen and have seen Bitter Ridge. Plenty with him I haven’t gotten too yet but always a work in progress. Thanks for pitching in.